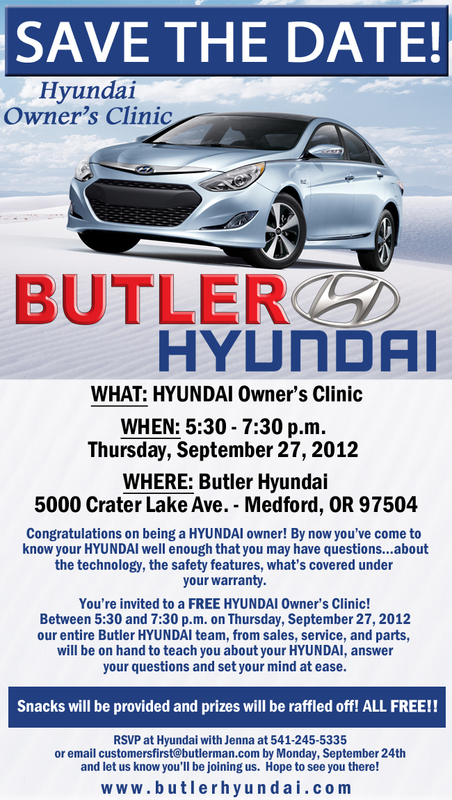 Why Attend Butler Hyundai Owners Clinics? Butler Auto Group held its first Owners Clinic/Open House nearly a year ago and, in that time, we’ve learned some things. First, we’ve almost mastered the formula for determining how much food to buy. Second, we’ve discovered how much fun it is getting to know you! And third and most importantly, we have a better idea what you hope to get out of the experience. Butler Service Manager Curtis Hancock says, while every customer is different, many of you have similar questions. The following are the most popular topics addressed at our events. All things technological and electronic. The steps for pairing your phone or garage door opener with your vehicle aren’t always intuitive. Curtis says a majority of customers who attend our open houses are looking for help getting synched with their car. Spare tires. Some cars don’t have them. Some Hyundai models, for example, come stock with a flat tire repair kit instead of an extra tire, which is great but only if you know how to use it. We’ll teach you. Introductions. We’ve always found it a little weird that service and maintenance work kind of takes place behind the curtain. While we understand the necessity of such (it would be unsafe to let you wander around in our shops) it’s still odd that you drop your car off without knowing who’s working on it. So, we decrease the mystery by having all our service technicians on hand for you to meet, chat with, and get to know. That way, you won’t have to convince yourself your vehicle’s in good hands; you’ll know it for sure. Warranties. What does yours cover, and for how long? We help clear up the misconceptions and tell you which items are most important to have taken care of at a dealership and why. So, that’s just some of the information you say you appreciate learning. On the fun side, there are free raffle prizes (a new set of tires, anyone? ), coupons for discounts on service work and accessories, and a complimentary car wash. Not to mention the food… a light dinner complete with a tasty assortment of desserts. It all makes for a sweet evening, indeed. for details and then drop us an email at customersfirst@butlerman.com saying you’re coming. See you there!